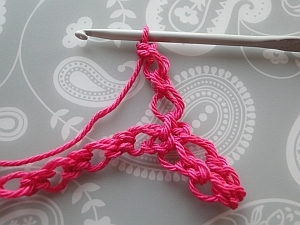 I'm going to work a short length of Solomon's Knots for our foundation row. Many patterns will tell you to start by chaining 2, then working a sc into the 2nd chain from hook. 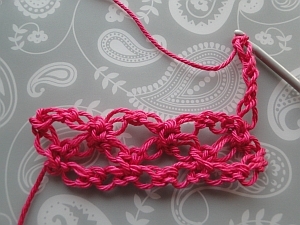 But I am going to begin with 1 chain, then I'll start my knots. 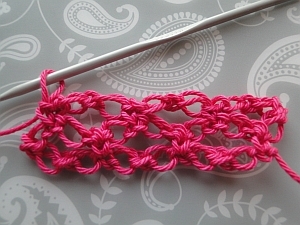 Some patterns also ask you to work two different lengths of knot. 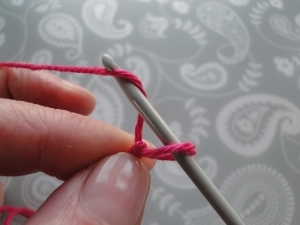 The loop I pull up for my knot is not very long, about half an inch, which is just over a centimetre (1.27 cm to be precise!) - but you can pull up longer loops if you like, whatever you feel comfortable with. 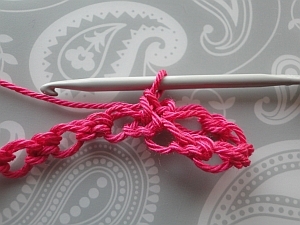 This is a stitch that seems complicated, but isn't; a little practice, and you'll be knotting like crazy! 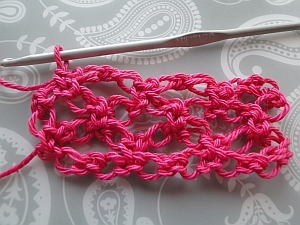 And this stitch does work up fast, which is always a very big plus. Start with a slipknot; ch 1. Now for our first knot. Hold your slipknot and 1st chain firmly. 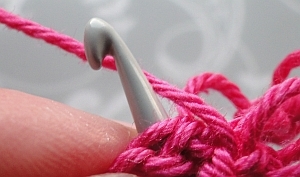 Pull up a loop with your hook as if you're going to make a long chain. 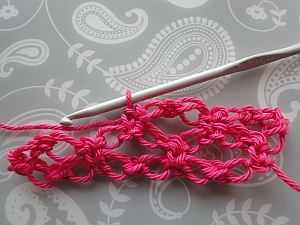 Pull yarn through long loop. 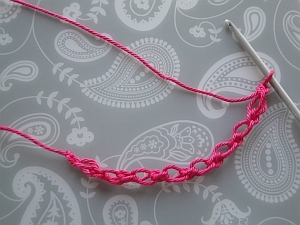 You've just made a long chain stitch! 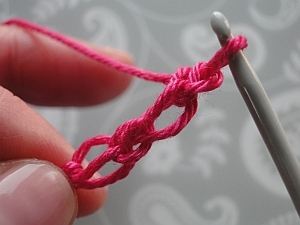 Work 1 sc into that loop; it's the "back loop" of your long chain stitch. 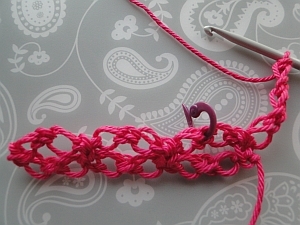 Then make another long chain stitch, and work 1 sc into the back loop again. Turn your work. 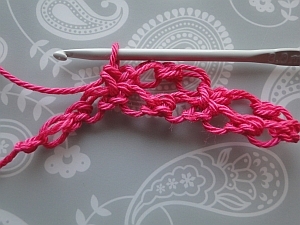 You'll have two loops at the top between the sc stitchs and one loop at the bottom. Then keep going! Work 3 Solomon's Knots for your turns and 2 as you work along the row. 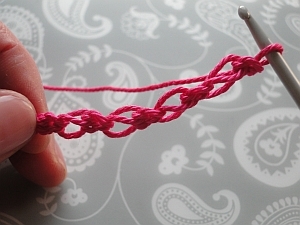 I don't know about you, but quite a lot of questions came into my mind as I began to work on my knots. So here are my FAQs - answered! 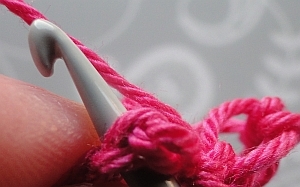 How long should each stitch be? This depends on the pattern. Some patterns will give you an exact length of the "long chain" to pull up; in other patterns, it's up to you. 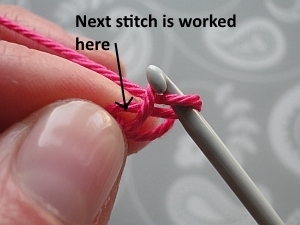 In many patterns I've seen, you have to work stitches of two different lengths, as I mentioned above. I've tried to avoid that in the designs I've created. How do you work the sc into the sc? Then I read an excellent series of articles by Vashti Braha about working Solomon's Knots - which she calls Love Knots. 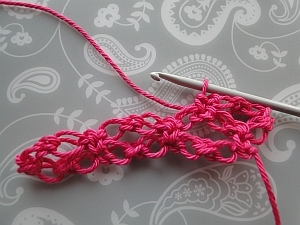 In her second article, she talked about working under three loops instead of two. Apparently, this is a more secure way of working the knot - especially if the item has to be washed a lot or will get a lot of use. 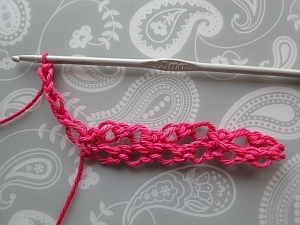 I think that for now, you can work your single crochets just as you wish, and once you've got used to the stitch, you can start to think about these little tweaks. Is there a good edging for a piece made with Solomon's Knots? 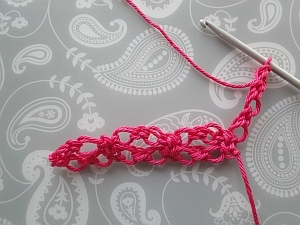 Hmmm... you know, once you've made up a sample piece with this stitch, you'll soon see how stretchy it is! You can pull it one way and another, and it will move very freely. I've tried putting edges around a square made with Solomon's Knots. 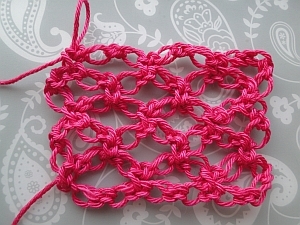 The stitches in the middle of the square didn't like that very much; almost any edging will be firmer and tighter than the stitches it encloses. The edging ends up being a hard frame around a rather soggy middle! Now, some items I have seen do have edgings, so it's not impossible. 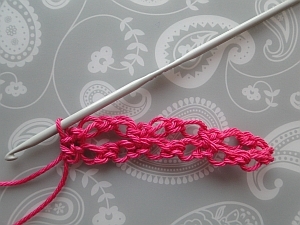 And you can check out my pattern for a Solomon's Knot Scarf which has a simple edging at the beginning and end. But generally speaking, don't expect to work some knots and whizz around the edge with some shells etc, as you might be disappointed.